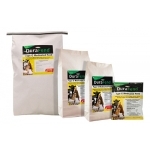 Feed straight from your hand, scattered on the ground or in a feeding dish as a treat only. Made with 100% all-natural whole dried mealworms and shrimp. 16 oz. Pelleted poultry treats with dried mealworms and added probiotics. 16 oz. 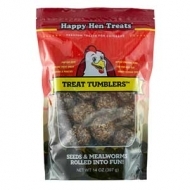 Happy Hen Treats® Treat Tumblers™ are mealworm treats in a ball for chickens! Toss them out and watch them tumble! 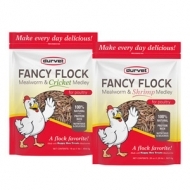 Your chickens will peck and play with this delicious treat. 14 oz. Protein Bar for poultry with dried mealworms, sunflower hearts, and peanut flour. 5 oz. 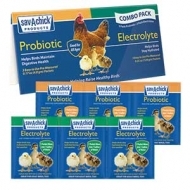 The Sav-A-Chick® Combo Pack includes one 3-strip each of Sav-A-Chick® Electrolyte and Vitamin supplement and Sav-A-Chick®Probiotic supplement. 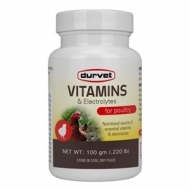 Use both supplements together for 3 days per month to help reduce pathogens in the birds’ environment. 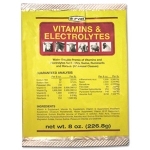 Electrolytes contain energy, helping beneficial bacteria grow in the digestive tract. Probiotics can optimize productivity and aid in digestive health. Blend of cracked corn, dried mealworms, and herb pellets. 2 lbs. 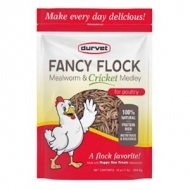 Fancy Flock Mealworm Medleys – Make a flock have an extraordinary day with some Fancy Flock! 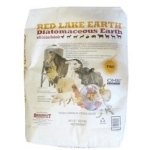 Made with 100% all natural whole-dried mealworms and shrimp or crickets. 16 oz bag. Amprol 128 for Coccidiosis for Chickens 10 Oz. 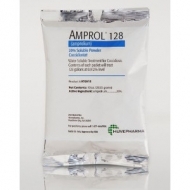 Amprolium, the active substance of Amprol® 128, is a thiamine antagonist. 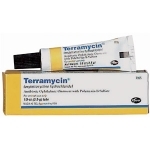 The anticoccidial effect of Amprolium is achieved by inhibiting the Eimeria spp. to uptake thiamine. The thiamine requirement for Eimeria spp. is, compared to animals, relatively high and therefore Amprolium will cause starvation of the parasite because of thiamine deficiency. As this way is unique, Amprolium does not show cross-resistance with other anticoccidial preparations.A development confirmed that over 90% of the Amprolium consumed by the bird remains in the intestines and is eliminated within 48 hours. 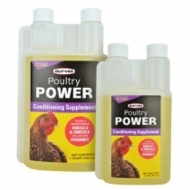 Poultry Power is an easy to feed conditioning supplement, containing a natural source of Omega 3 & 6 fatty acids and Vitamin E that helps to support health, vitality and appearance of your bird. Approved for use on poultry of all classes. 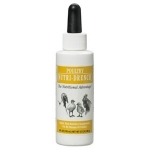 As an aid in treating all varieties of poultry, including bantams, ducks, turkeys, geese and game birds. For internal and external applications. 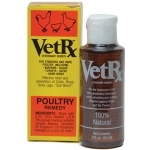 Effective relief from respiratory diseases, CRD, roup, scaley leg mites, favus, eye worm – for all poultry – chickens, turkeys and game birds. It is measurable in the bloodstream within 10 minutes. 50% is absorbed in 30 minutes. 99% utilization. 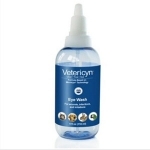 Wormer for use in drinking water for the removal of large roundworms from turkeys and chickens. 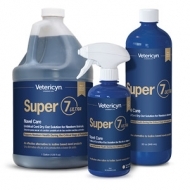 Also removes large roundworms and nodular worms from swine. 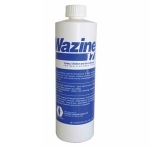 Worming every 30 days is necessary to break the large roundworm life cycle. Piperazine. 16 oz.